I’ve been wanting to read the Bible for so long but it is initimidating to me. This looks very inviting and i would love to win one !! I’ve been wanting to try journaling and what a great choice bible to start! I LOVE this bible! I found it by accident and ordered it…I have a journaling bible so I actually copy some of the illustrations into my other bible, using the Beautiful Word Bible as a sort of template, because I’m not that creative.. I also love the way this bible smells. I know…weird, but I’m a book sniffer. By the way, if for some reason, I win a copy, please pick another winner. I already have one. I have seen this Bible advertised but not seen it up close! Looks exciting … especially for those who process through drawing (my daughter!!!). Hhhhmmmm….or maybe I could give it a try! Thanks for the opportunity ….. I had a journaling Bible on pre-order but it still is at the printer so I finally cancelled my order. Since this concept of journaling/doodling in your Bible is still new, products aren’t easy to come by. I would be so thrilled to be chosen to receive this Bible. Blessings! The same I’ve had a journaling Bible on preorder – Sheila is correct in saying that they are hard to come by. I’ve love to have one faster since my heart is in the right place and I’m excited to start my journaling adventure! God. these bibles are amazing! I have started bible journaling and I have lots of ideas swirling in my head. lots of tabs and post-it notes in my study bible for inspiration! love this blog, Kelly!! For years I’ve struggled with finding space to make notes in my bible (you should see my favorite one. Can barely see the print for the notes ) or I would use a notebook for notes which meant I probably never looked at the note again. To have a bible that would give me the space for note taking and/or journaling would be amazing. I just love your tips! I’ve been wanting to try this but the first step seemed so daunting! Thank you for the guidance. I really appreciate your review , I’ll go get “better bifocals”. Nest month I will be leading a retreat for women at our wonderful 150 acre camp in TN. Most of the women are from very dysfunctional famiilies, the area is ravaged by drugs and poverty. If you choose to gift me with this lovely Bible I will give it away to one of the women at my retreat. I am sure it would be a catalyst for desire to study God’s word. Our church is small, but we have been able to offer a free summer camping experience to the children in our community. Check out our website. This bible looks like a beautiful way to get me deeper into God’s word. and deeper into His love!Also, your book on prayer sounds like a perfect accompaniment that I’m going to take a look at as soon as I submit this comment! This has been on my wish list. Thank you for a chance to win one. I’m glad I found your blog. It has been a blessing. This would be a wonderful gift I would give Rachel, my daughter-in-law. She doesn’t communicate with words, but with creating gifts for family and friends. Always looking for a way to bring us closer. I feel like after reading all the comments that there needs to be a Bible journaling class! I, too, have this interest but no idea where to begin (other than Pinterest)! What a beautiful book to start that journey! What a brilliant thing. I have been”illustrating” Bible verses that have spoken to me lately. I get a picture in my head generally of a key word , as I’m reading it and draw from there. We have a collection stuck up around the house. This Bible would enable me to do it so much better…and not run out of space. I love making notes in my Bible. I’d LOVE this new one! I have been looking for a journaling bible, and this looks like the perfect one to have to get started! 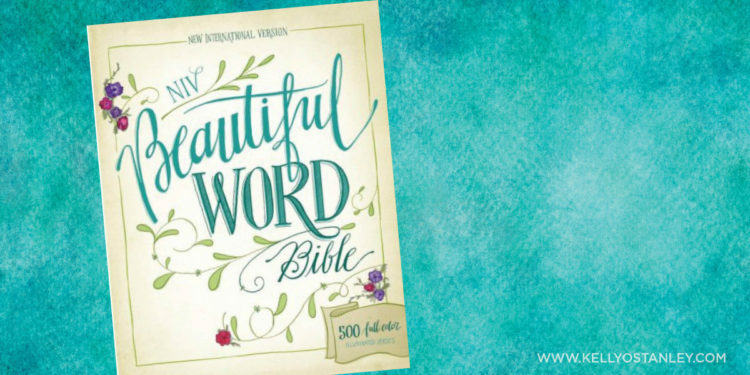 Would love to win this bible! This has been on my wish list for quite some time. I am very intrigued by the Bible art journaling. I have seen such beautiful ARTWORK. This very well could be the motivation I need to step out and create beauty that I lifted out o f my soul as I meditate on God’s Word! Sounds like something I could use to help reinvigorate my Bible time. Been a dry time. Thanks for your book Praying Upside Down. It was a real blessing to me. God bless. I would be excited to win a new bible to help me grow closer to him. I would very much like to win this Bible and start journaling. I know some women who are in a Bible journaling group and get so much out of it. Thank you for offering to share these Bibles. I love to doodle in my Bible. My Bible is very colorful. I would love to Win this Bible.. I love to journal and doodle in my Bible. I love Bible journaling and I’d love to own this Bible as well! What a wonderful idea! This is another great way to enjoy the Bible. Thank You for this giveaway! I’ve been looking at different journaling Bibles and think I have reached the dreaded analysis paralysis. Heal fast!! You amaze me!! I can’t wait for the new book I wish it were out now!! I have been researching the bible journaling and I’m so excited to get started !! This is soo good knowing one who is willing share the most precious thing in world,and finding happiness in sharing.